I hit the community trail last week with the intention of running for 60 minutes to stretch out my legs after my last little race (recall the Alcatraz Challenge). I was feeling pretty good, so good in fact, I felt like I was flying up the first long hill. 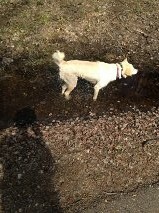 I saw a girl and her dogs up ahead that me and Kobi know from trail encounters so I decided to keep Kobi off leash. I forgot Kobi is a scent dog, not a sight a dog. 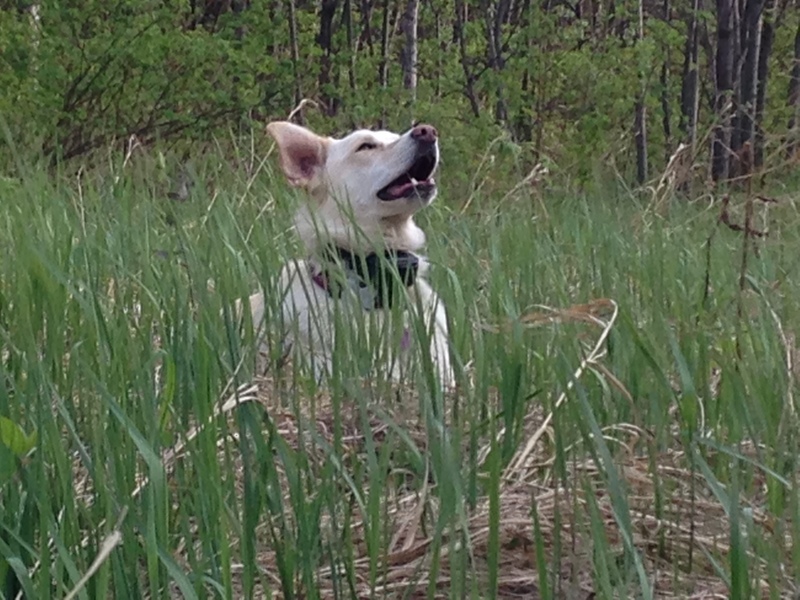 As I was flying around a switch-back Kobi “sighted” the dogs up ahead, but didn’t recognize them. She stopped abruptly right in front of me (as I was flying up the hill). For a 40 pound dog, she can hold her ground. I crashed into her and took an epic wipe-out – on pavement. Fortunately I was holding my phone in one hand and her e-collar controller in the other (forgot my FlipBelt) and skidded on those first. Unfortunately my knees weren’t carrying anything and I skidded on those next. After falling, I did not jump up in embarrassment as it hurt so bad. Instead I let out a very loud, long string of expletives. I just can’t control my vocabulary when angry or in severe pain (it’s a superpower). 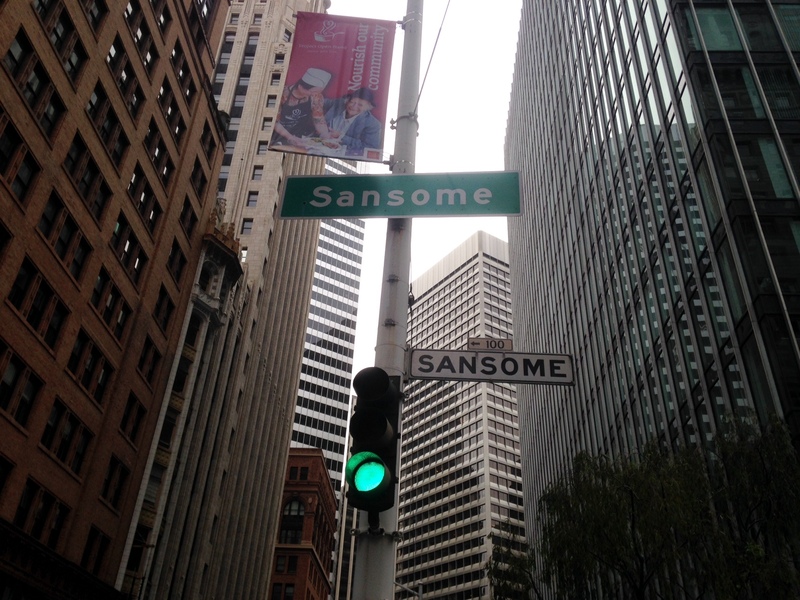 The girl up ahead was too frightened by my language to offer assistance, I don’t blame her. I sat in the middle of the trail for a few minutes and wondered if you could actually break a knee. I finally got up and hobbled around assessing the damage. I had nothing to wipe up the blood pouring from my knees and of course I was wearing my white Injinji toe socks (I love toe socks and thank goodness for OxiClean). Eventually I carried on with my run and received a few odd looks from passers-by, they probably thought I was pretty tough. A few days later I was in the closet digging out more band-aids for my knees and knocked over a giant bottle of shampoo that landed smack in the middle of my big toe. That hurt so bad I broke out in a sweat. I think I’m clumsy. Have you ever worn toe socks – do you love ’em or hate ’em? Has your dog ever caused an epic wipe-out? 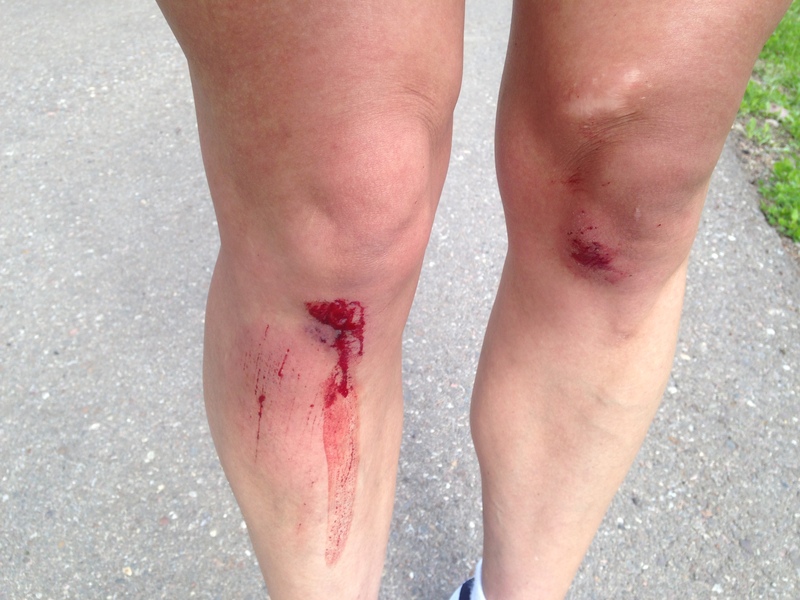 Do you carry band-aids when running? I think I might start carrying some (if I could remember my FlipBelt). What’s the worst thing you’ve dropped on your big toe? Categories: Dogs, Kobi, Running | Tags: falling while running, Kobi, odd running injuries, tripping on your dog | Permalink. 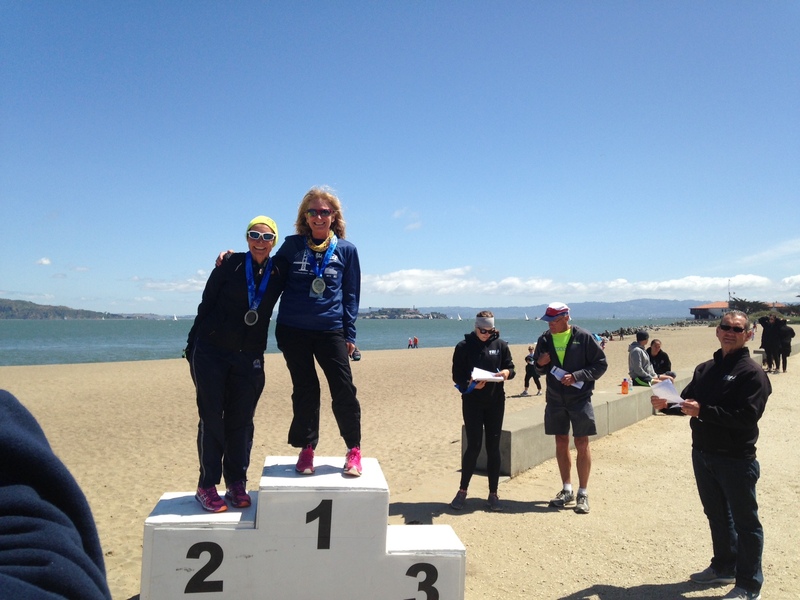 On Sunday I did a pretty cool event – The Alcatraz Challenge in San Francisco (1.5 mile swim from Alcatraz and 7 mile run across a famous bridge). I did not do the swim. 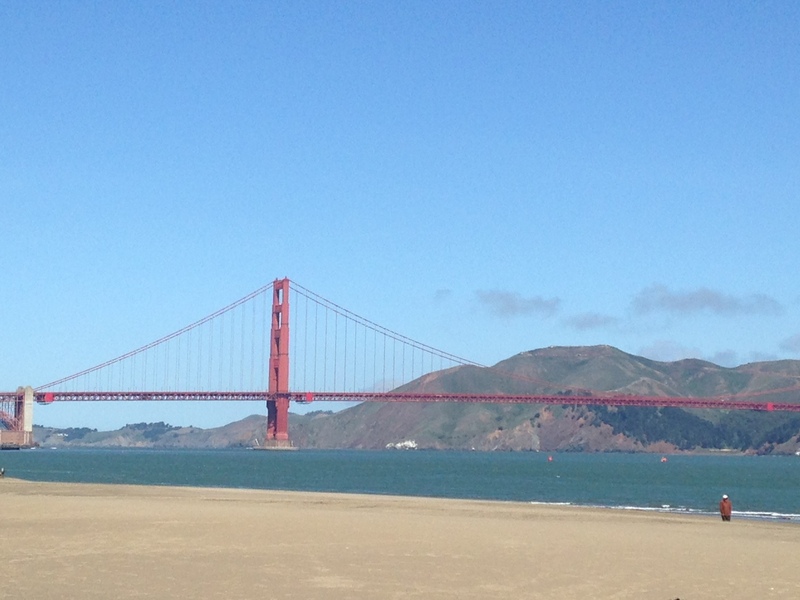 When I agreed to this, my entire motive was to visit a high school friend living in the city and run across the Golden Gate Bridge. I am not yet a strong or brave enough swimmer to jump off a ferry and swim from Alcatraz to shore. But my friend (whose idea this was) hooked me up with a super awesome swimmer and new besty Karlene (aka Aqua Girl) so how could I say no. Two of the four of us did the entire event (1.5 mile swim and 7 mile run). I think I got off pretty easy. 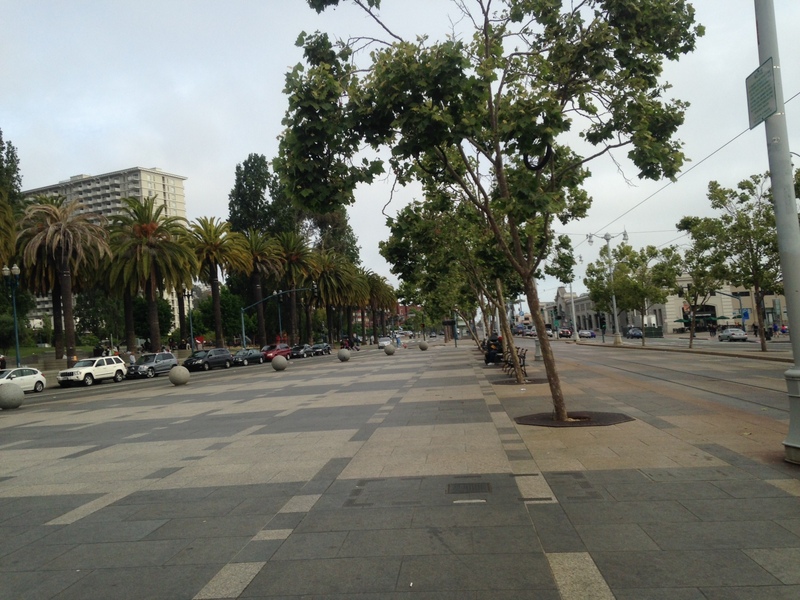 Saturday AM we did a quick pre-race run through the city. 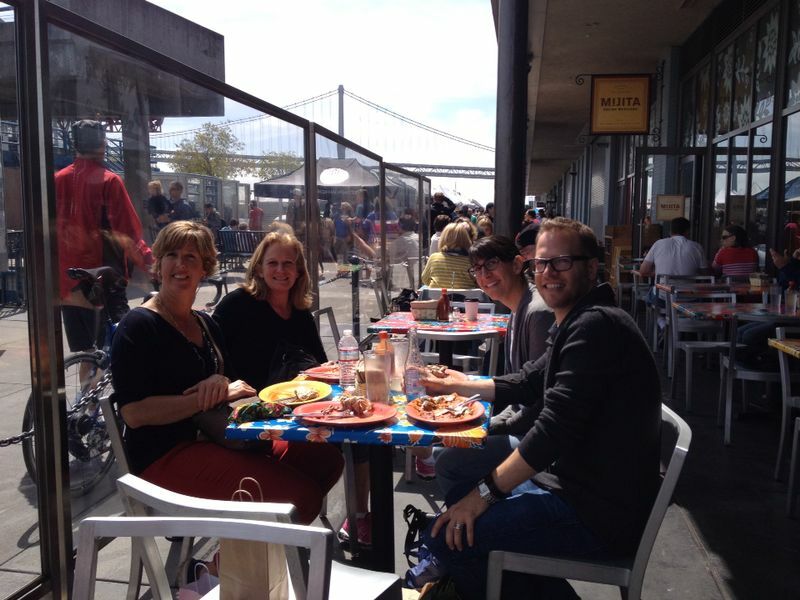 Then we met up with my high school friend at the Farmer’s Market. He also has a blog so you must check it out because it’s about art in San Francisco and we all need to appreciate art in that city. 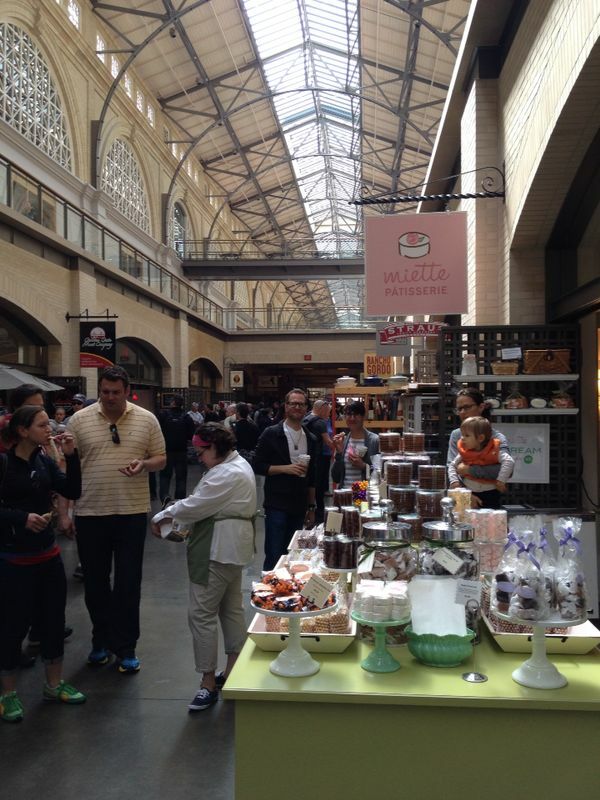 The market was amazing. I forgot that fruit comes from California and that it isn’t weird to see apricots and cherries in May. I do need to get out more. My new pre-race fuel – pecan macaroon from Miette Patisserie. After the market we hit the race package pick-up and listened in on the swim presentation – what you need to know to survive the swim. The package pick-up was at this place called the Sports Basement. I could have spent days and thousands of dollars there. 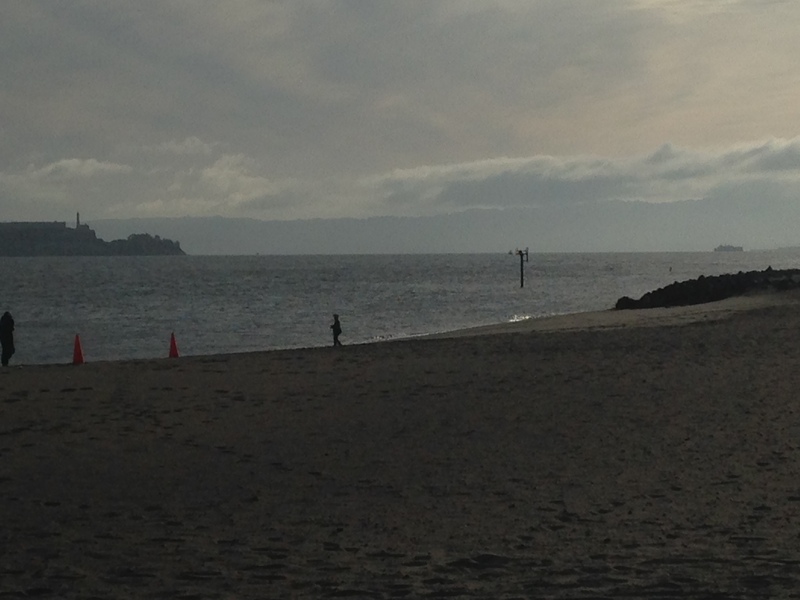 Sunday AM I saw my friends off to the ferry while I headed to Crissy Field to await their arrival. 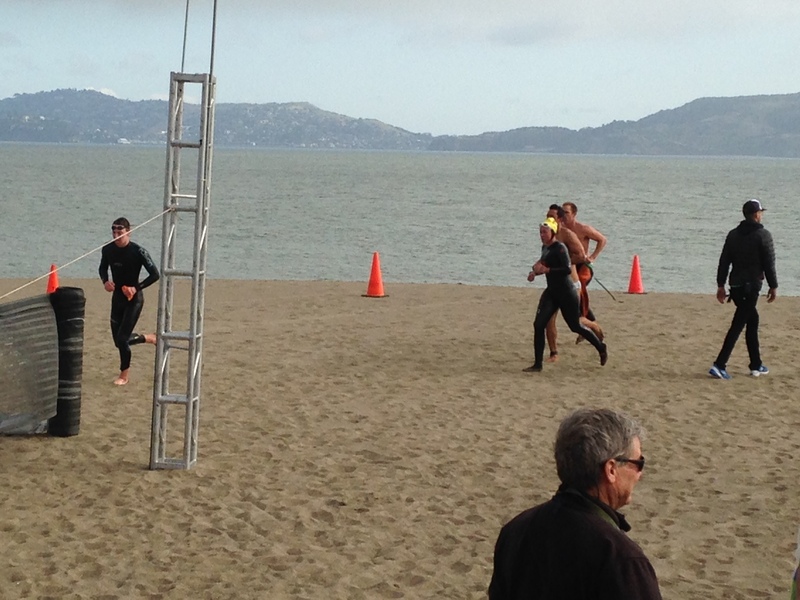 It was terribly windy and likely the worst swimming conditions the event has seen in years. The first swimmer showed up in 33 minutes and then my swimmer showed up at 43 minutes. 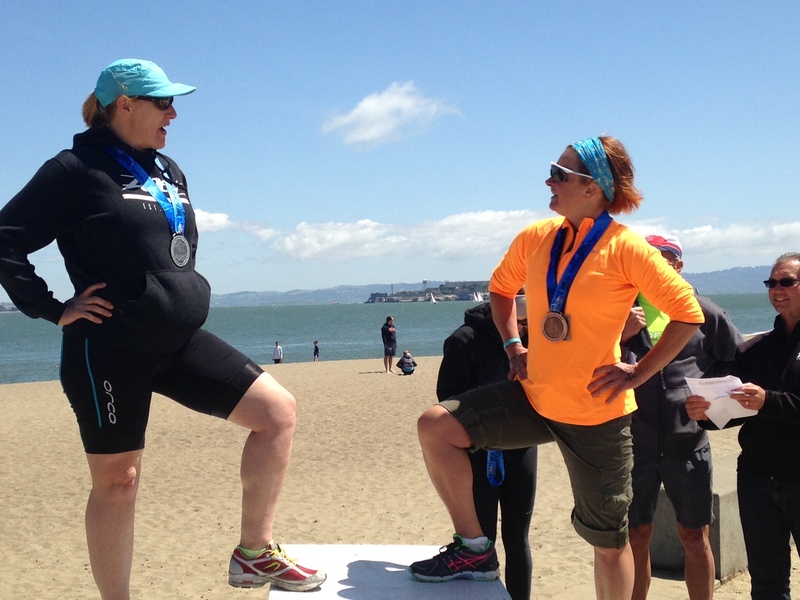 The first thing my new besty said to me (recall she’s an amazing swimmer) when we found each other at the transition, “those were the worst conditions I’ve ever swam in!” I gave her a hug, took her chip and off I ran. 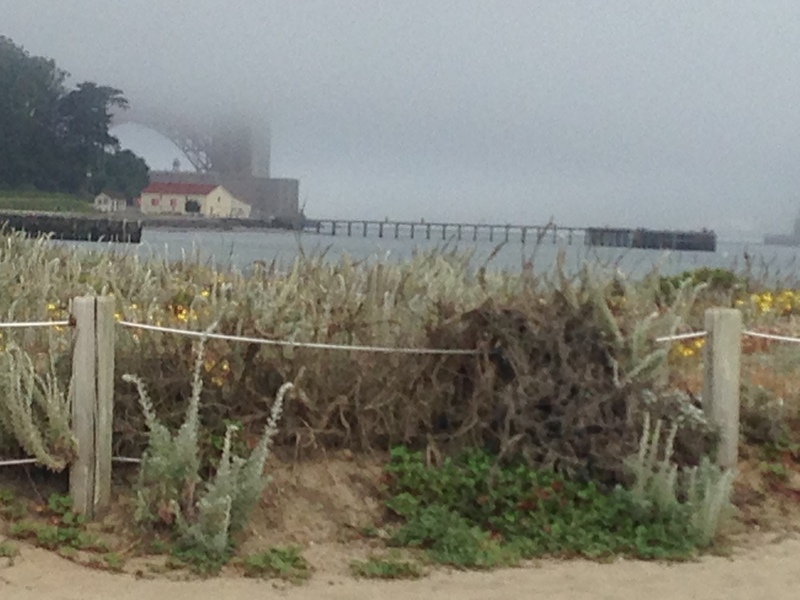 Of course the fog had rolled in over the bridge so I didn’t see much for views. It was less foggy on the way back. It felt like I was running fast as my legs felt weird and I felt like throwing up a few times (who needs a watch when you can determine speed by how badly you want to throw up). I ran the 7 miles in 49:27 so I was pretty happy. Funny story – they had computers out so you could check your times – the other women’s teams were much younger and one team had randomly commented to my swimmer how some “40 year olds had beat them”. Aqua Girl laughed and said that she was one of those 40 year olds. Feels good to beat young-uns. We came in first for the women’s open division. The best part was that my other two friends also placed! One was first in her age group and the other was third. Way to go Canada! 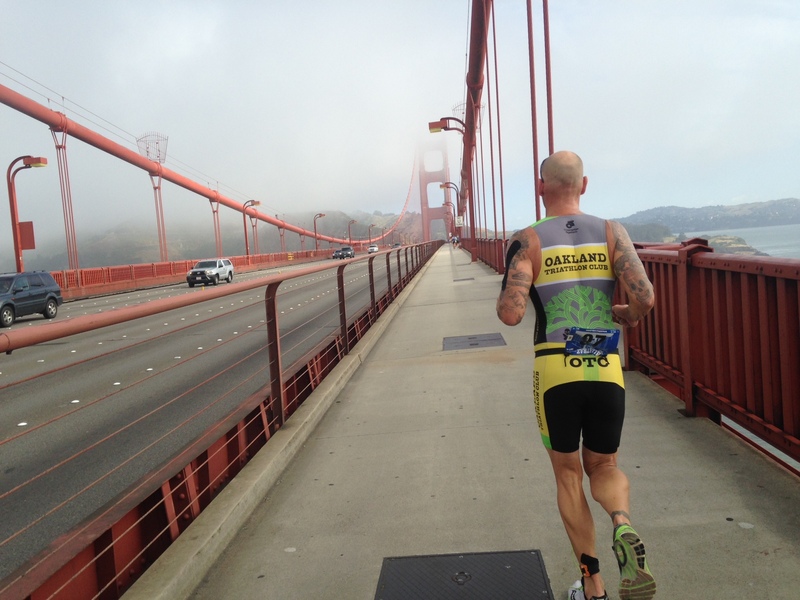 Ever done the Alcatraz Challenge? Would you ever be compelled to do such an event? How good are you at taking “fast photos” while running? 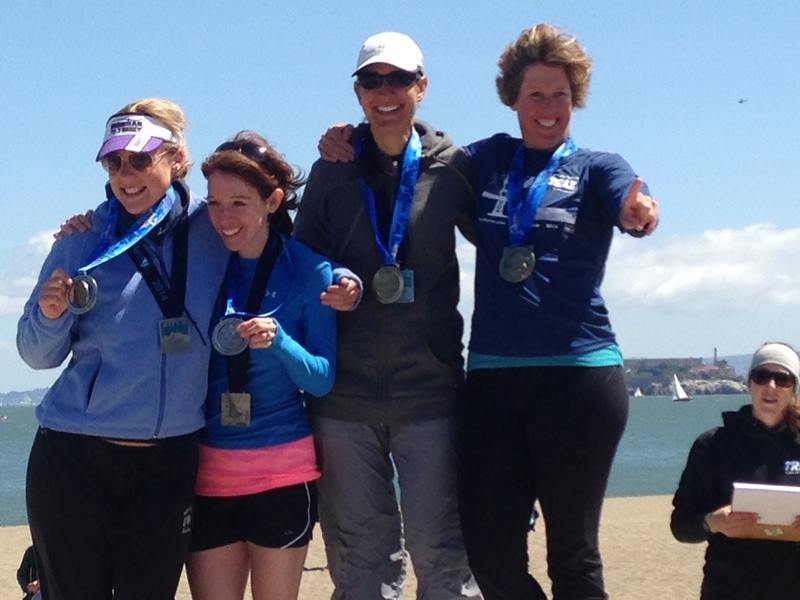 Categories: Races, Running | Tags: Alcatraz Challenge, Crissy Field, Golden Gate Bridge, Miette Patisserie, San Francisco | Permalink. Springtime can be a really nice time of year in the north. The days are very long, the birds are back and singing constantly, the frogs are croaking, and once the mud dries, the running is amazing – until the mosquitoes come out and terrorize you. Translation: 3 days of great running. 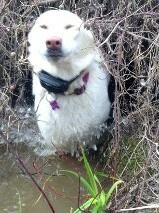 Kobi also loves this time of year as there are water ponds and puddles everywhere so she can cool off and regain her super powers every 10-15 minutes. 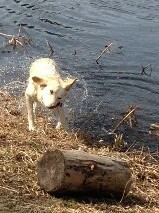 She also discovered playing in culverts. Last week she ventured into one and had to run in and out of it at least 5 times before I could coax her on again. 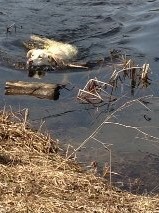 After our playdate with the culvert on a walk last week, I wanted to go for a bike ride. You see, I signed up for a triathlon so I had better get on a bike a few times before the event. Turns out the day I decided to ride was rather warm (24C) and that resulted in the first of the year flying ant invasion. Apparently under the right heat and humidity, all the queen and male ants from all over Antville fly out at the same time in order to meet up and procreate (I Googled it). They mate, the dudes die and the females go back and make their colonies bigger and also diversify the gene pool. Please feel free to clarify any of this if there are any ant experts out there. It’s kind of cool to read about, but not so cool to bike through swarms of slow flying large insects. In short, it freaked me out. I had several (it seemed like 100’s, but likely only 10 or 20) of them hit me and stick to my shirt and helmet, and get tangled in my hair (of course they had to get tangled in my hair) all while I’m speeding along on my bike. 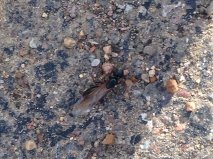 A flying ant was heading straight at me as I was barreling down a gravel road. I ducked, gravity took over, and I crashed and slid along the gravel. It was the memory of that crash that helped me maintain my cool all while being pelted by ants, I’m also far too old to fall off a bike. Oh yeah, my current bike doesn’t look like that one. Have you experienced a flying ant event or other large insect event? 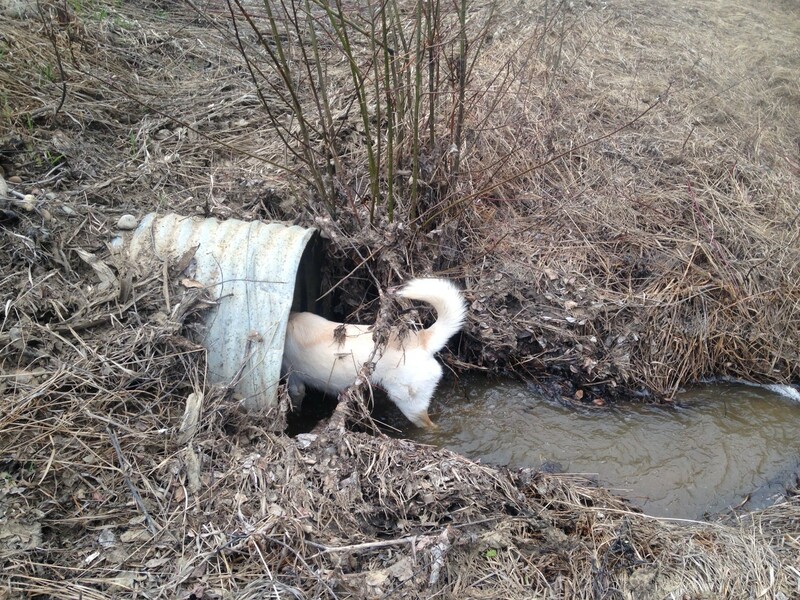 Does your dog dig culverts? Do you like riding or running or both? 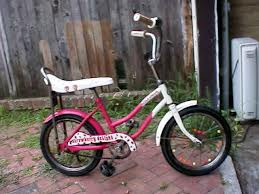 Did you have a bike like the one above – maybe not in pink – or am I just the oldest coolest person out there? PS Stay tuned, I had a pretty cool adventure over the weekend…. Categories: Dogs, Kobi, Running, Training | Tags: cycling, flying ants, running outside, triathlon | Permalink. 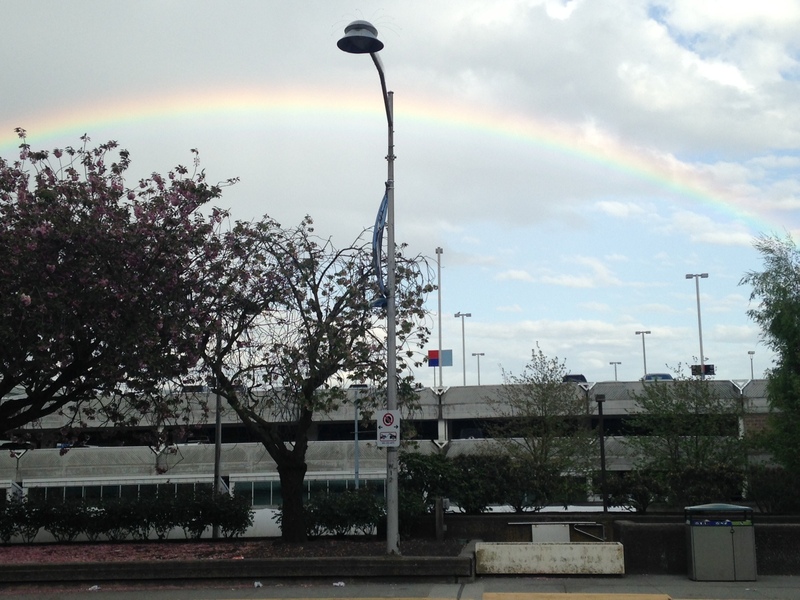 It wasn’t all rainbows on our run Sunday. I ran the BMO Vancouver Half Marathon on May 4 (on Star Wars Day). I should have dressed up like Luke Skywalker or an Ewok, but I didn’t. Pre-race we (me and my friend R) hit the expo Friday and Saturday. Saturday we met up with our buddy John Stanton (Running Room founder) at the 3km Friendship Run after eating a giant breakfast at this amazing Italian place we stumbled across. I’ll just say I didn’t eat oatmeal. We ran to the train in the pouring rain and all I could say and think was “why didn’t I wear capris? !” Then after walking 20 minutes in pouring rain we got to the race area and got into a never-ending port-a-potty line. Twenty minutes later I still hadn’t remembered to double knot my shoes. We were the last 2 people out of the toilet area – I kid you not. I was having a panic attack about not getting to our corral in time and my friend said something wise or smart or funny to me that snapped me out of it. A slap in the face likely would’ve worked too. We made our way over to the start and I naively asked if I could still get up front to my corral – I was told they left 10 minutes ago. We were well behind the 2:30 pace bunny. Once we finally got going I ran like I stole something for the first 10km and passed thousands (maybe it was just hundreds) of people. By 13km I wasn’t having as much fun as I had been having, but was finding the rain tolerable. I was cold a few times when the wind was coming off the ocean, but otherwise it was okay. By 18km I was feeling the hate I usually feel for the 21.1km distance. Then I thought about how I forgot to double knot my shoes. Either my thoughts drew the universes attention to this (I do have super powers) or I subconsciously felt my shoelace getting looser. By 20km my shoe lace was whipping around like nobody’s business. I didn’t want to stop in front of the crowds coming up and I didn’t want to trip so I stopped to tie it. I don’t know how many people passed me as I wasn’t counting anymore. Eyes are closed again. I’m sleep running. I stopped at the “find out your time booth” on the way out of the race area and was pleasantly surprised at a chip time of 1:38:13. I was expecting a 1:40ish considering my lack of training and the rain. Then I ran 5 blocks to the hotel as I was suddenly frigidly cold. Okay, now to the best part. This event also hosts a Boston Qualifier marathon. My totally fast second cousin was running the marathon. They start after the half so I had time to get changed and make my way back to the finish line. I checked his split times on-line and saw he was running fast!! I dragged R back with me in the pouring rain and screamed and cheered at the marathoners (and halfers still coming in). Then I saw him and the clock read just over 3 hours!! I don’t think I have ever screamed so loud in my life! He ran 3:00:36 and qualified for Boston (he had to run under 3:05)!! Fricken Amazing!! I am in awe of his running talent. We all met up for dinner later and he said he might do Boston. I think I lectured him for about 15 minutes about how he had better do Boston, no maybes, just do it! Oh yeah, friend R had the idea of counting dog breeds we saw along the race route. I counted 15 and she counted 35. According to the photos, I do run with my eyes closed half the time so that explains that. I also lost track of breeds after the first six dogs. Do you count things while racing or out running – like beer cans, dogs, people you pass? Do you like racing in the rain? Ever wear a garbage bag to a race? Do you think my fast cousin should sign up for Boston (I only want to hear yes answers)?! 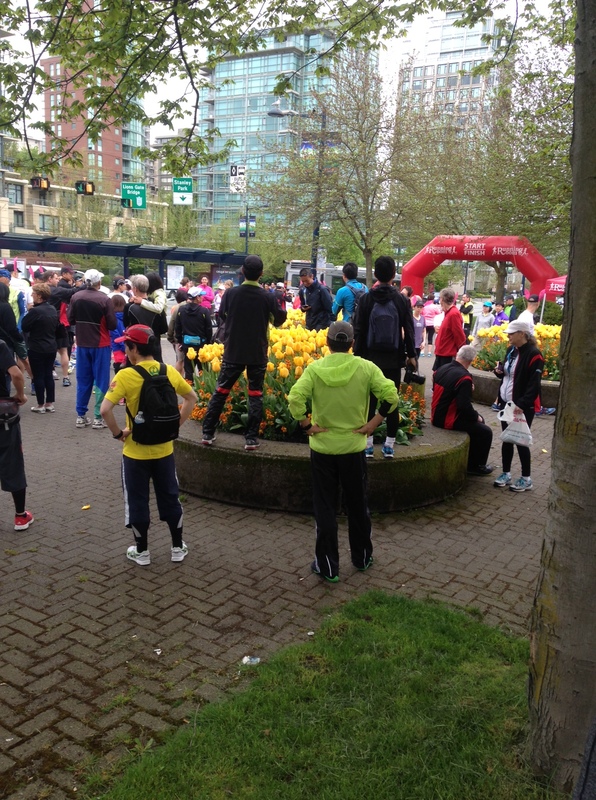 Categories: Races, Running | Tags: BMO Vancouver Half Marathon, BMO Vancouver Marathon, John Stanton, May the 4th be with you, Running in the rain | Permalink.